Elu Thingol (died Y.S. 502) is a fictional character in J.R.R. Tolkien's Middle-earth legendarium. He appears in The Silmarillion, The Lays of Beleriand and Children of Húrin as well as in numerous stories in the many volumes of The History of Middle-earth. He is notably a major character in many of the stories about the First Age of Tolkien's Middle-earth and he is an essential part of the ancestral backgrounding of the romance between Aragorn and Arwen in The Lord of the Rings. Thingol is introduced as the King of Doriath, King of the Sindar, High-king and Lord of Beleriand. He is said to be "the tallest of all the Children of Ilúvatar" and the "mightiest of the Eldar save Fëanor only". In The Silmarillion as Elwë, he is introduced as one of the three chieftains of the Elves who depart from Cuiviénen with Oromë as ambassadors of Valinor and later become Kings. Upon his return, he persuades many of his kindred, the Nelyar, to follow him back to that country. This host becomes known as the Teleri. On the Great Journey to the West the Teleri lag behind, loving Middle-earth and having mixed feelings about leaving it for Valinor, and do not arrive at the coast until after the departure of the moving island of Tol Eressëa. Thus, they stay in Beleriand for many years, until Ulmo pushes Tol Eressëa back again to fetch them. During this time Elwë encounters Melian the Maia in the woods of Nan Elmoth and, enchanted by her, he falls in love with her. They remain entranced together for some 200 years. Many of the Teleri searched for him and would not leave without him. After Thingol awoke from the trance, many of the Teleri had grown to like Beleriand and decided to stay there. Thingol and Melian become king and queen of the Sindar, the Teleri who stay in Beleriand. Thingol's brother Olwë later becomes the King of Alqualondë and High King of the Teleri who do journey to Aman. Thingol previously visited Valinor as an ambassador and is, uniquely, both of the Sindar and of the Calaquendi. His and Melian's daughter, Lúthien, is said to be the fairest of the Children of Ilúvatar ever to live. Thingol's heir is Dior, son of Beren and Lúthien. 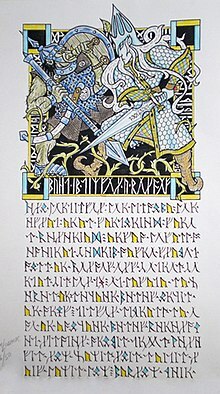 Other kin of Thingol, stated by Tolkien, for which the family relation is unrecorded or unexplained in the tales are Círdan, Daeron, Celeborn, and Eöl. He is the ancestor of many prominent characters, Elves and Men, including Elros, Elrond, Aragorn and Arwen. He is also family to Galadriel, as she is the child of his niece, Eärwen. When the War of the Jewels began Thingol fought the First Battle of Beleriand defeating Morgoth's invading east host. After that battle Thingol realised that he could not match Morgoth in open battle and adopted a defensive strategy for his kingdom by closing the borders with a military March Ward and Melian's magical Girdle, a maze of mists and shadows. Sensing unspoken, dire causes for the arrival of the Noldor, he denied entry to Doriath without his leave to all except the house of Finarfin, for they were also descended from Olwë. The lords of the Noldor concealed from Thingol the Kinslaying at Alqualondë, where Thingol's Telerin kinsmen in Valinor were slaughtered and their ships stolen by Fëanor's followers. Even those Noldor who bore no direct responsibility for the crime felt the shame of it, and they grew angry at the sons of Fëanor for their pride. Eventually, Círdan the Shipwright heard rumour of the Kinslaying, and sent word to Thingol. Outraged, Thingol confronted Finrod Felagund with this news, but Finrod made no reply rather than accuse his kinsmen. His brother Angrod could not bear the blame any longer. In great anger, he revealed Fëanor and Fëanor's sons' responsibility for the Kinslaying, and for the misery of the long passage of the Helcaraxë which Finarfin's and Fingolfin's kin suffered. Thingol forgave the houses of Fingolfin and Finarfin, but he decreed that their language would never again be heard or spoken in Beleriand and still bore hatred for the Fëanorian Noldor. Following the Dagor Bragollach, a Man named Beren fled to Doriath, driven by a destiny that thwarted even Melian's power, and Lúthien, Thingol's daughter, fell in love with him. Thingol did not wish them to marry, considering Beren unworthy of Lúthien. He demanded as a bride-price a Silmaril, which jewels were at that time set in Morgoth's crown, thinking it would be death even to make the attempt to recover them. Though initially intended by Thingol merely as a way to get rid of this presumptuous mortal, as the quest was deemed impossible, the quest he laid on Beren had the effect of placing Doriath under the sway of the Oath of Fëanor, since against all odds, Beren succeeded in retrieving the Silmaril after many difficult adventures and married Lúthien. As was required by their oath, the sons of Fëanor demanded that Thingol give them the Silmaril. In spite of Melian's counsel to the contrary, he refused, remembering the sacrifices that his daughter and son-in-law had to endure to retrieve it, and being enamoured of its beauty. Maedhros remained silent, however, since he was attempting to build an alliance to assault Angband, but his brothers Celegorm and Curufin openly vowed to slay Thingol and lay waste to Doriath should they return from battle victorious. Thingol thus fortified his borders and sent no aid to the Union of Maedhros, but gave permission to his marchwardens Beleg Cúthalion and Mablung to participate, under the condition that they not serve the sons of Fëanor. After the disastrous defeat of the Eldar at the Nírnaeth Arnoediad, Beleg returned to Doriath with the young Túrin Turambar, a grand-nephew of Beren, sent by his mother Morwen Eledhwen from Dor-lómin, which was soon to be overrun by Morgoth's forces, and Thingol received him gladly. Túrin later caused the death of the Nandorin elf Saeros, after the latter gave him a mortal insult. Thingol was at first outraged, but later pardoned Túrin after hearing the whole story. However, Túrin knew none of this and fled Doriath, fearing punishment, but he still refused to return even after Thingol sent Beleg to find him and bring him back, and afterwards, he suffered and died tragically. Húrin, Túrin's father, under a curse of Morgoth, blamed Thingol for the cruel fate of his son, and with scorn laid at his feet the Nauglamír, the Necklace of the Dwarves, which he retrieved from the ruins of Nargothrond. Thingol thought to place the Silmaril into the Necklace, and hired the Dwarves of Nogrod to do so. The Dwarven craftsmen also coveted the jewel and seeing that it was by their skill that the piece was made, saw no reason to give it up willingly. Thingol became enraged declaring that he was of the first Eldar to set off on The Great Journey and that they were guests in his realm. When he tried to take it from the Dwarves they slew him. This set off a chain of events leading to the destruction of Doriath and the scattering of its people. After Thingol's death Melian, who remained in Middle-earth by binding her spirit to that of her husband, chose to forsake her body and return to Aman as a Maia, removing the power which once protected it, leaving Doriath vulnerable to attack from without. Thingol built a fabulous capital city and fortress beneath a great hill called Menegroth, the Thousand Caves. He personally commanded the army of Doriath in the field during the First Battle of Beleriand. He led it again against an army of Orcs led by the formidable Boldog, whom Thingol killed in single combat. Thingol destroyed the Orc army in East Beleriand, and led the Hunt of the Wolf, Carcharoth. With the support of numerous allies, Thingol remained undefeated by the evil Vala Morgoth. Thingol's 'Hidden Realm' strategy is taken up by Finrod in Nargothrond and Turgon in Gondolin. In later ages, Thingol's forest realm with a capital fortress cave strategy is adopted by King Thranduil and the Elves of Mirkwood. Thingol is, in Tolkien's fictional language of Sindarin, a form of an epithet of Elu. Elu is from Elwë, Star-man (man in the sense male, not human). Thingol comes from sindacollo - grey cloak, possibly derived from his family trait of long silver hair. The Quenya form of the same name is Elwë Singollo, Singollo meaning Greycloak. Aranrúth - King's Ire, Thingol's sword. In History of Middle-earth, Vol. XII, p. 376 a stem, RUTH, is given with the sense "scar, score, furrow" It is worth noting that this was also the sword of the Kings of Númenor and very likely Ar-Pharazôn had it with him when he assaulted Valinor, where it was presumably buried with him. List Melian - Doriathrin Sindarin for Girdle of Melian. ^ J.R.R. Tolkien, Christopher Tolkien editor, History of Middle-earth, Vol.XI, (1994), p.21, "Fingolfin...acknowledged the high-kingship of Thingol"; p.380, Thingol is also acknowledged high-king by Círdan and his following: p.410, the Grey-elves of Mithrim acknowledged Thingol as high-king. ^ J.R.R. Tolkien, Christopher Tolkien editor, History of Middle-earth, Vol.XI, (1994), p.21, p.25. ^ Tolkien, J.R.R. (1977). "Chapter XIX: Of Beren and Lúthien". The Silmarillion. Allen & Unwin. ISBN 0-04-823139-8.